It’s hard to think of summer when our day temps have hit single digits in the past few hours, but if you’re a parent, summer camp is one of the tools that allows you not to lose it completely during summer break. Here on the Hill, we have a fabulous array of camps, from music to games to bikes, that can satisfy the needs and curiosity of the most discerning of school children. Eager to get started and find out how many options you have available to you? The J.O. Wilson Elementary PTA has you covered! 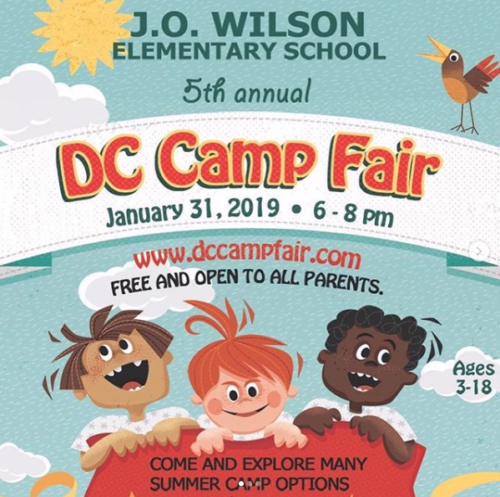 Their DC Camp Fair takes places tonight, Thursday, January 31 starting at 6 p.m.
You can also find more information by visiting dccampfair.com. WHY: Because it may be cold outside, but you don’t want to be left out in the cold when it comes to summer camps for your kids. Cheesy but true.